The practical considerations needed to select the appropriate approach to a given task carried out at height are weighed up by David Towlson. Acrophobia is an irrational, excessive fear of heights. It is relatively common, as phobias go. I think we should all have a rational fear of heights at least – that is, a respect for heights. If the world were made of Brie cheese (like the moon), there would be no need. But cheese is not considered a suitable material on which to build; it is far more satisfactorily utilised in sandwiches and goes well with grapes. Large, tall buildings have been around since ancient times; for example, the Ishtar Gate (Babylon), the Pyramids (Giza), the Parthenon (Athens), the Pantheon (Rome), Hagia Sophia (Istanbul) and many medieval castles, palaces and city walls remain throughout Europe. There has been a consequent need to work at height. This was all once done without the modern panoply of safety equipment. There is, however, at least some evidence that rudimentary access equipment was used, such as wooden/bamboo scaffolds – to varying standards. Gravity has also been around since ancient times – even in the modern world most mortals cannot easily escape it. It is self-evident that working at height involves many dangers, the main ones being workers falling from, through or between structures and dropping equipment/tools/materials on people below. Both can lead to serious injury or death. Both of these events can have multiple causes; for example tripping, the unexpected collapse of the building, access equipment or fragile roof covering. The fall may be a secondary effect of an activity or situation that would in itself have much smaller consequences if conducted at ground level; for example, high pressure jetting, operating a powered tool or a sudden gust of wind may momentarily unbalance the worker. At ground level this is recoverable, but at height it may not be. It may seem obvious what ‘Work at Height’ means. Most people instinctively think that working above typical average head height is when it starts to become dangerous. Examples such as repairing roofs (especially close to the edge), overreaching on ladders and accessing inspection hatches on top of road tankers spring to mind. If the statistics are to be believed, however, (never a foregone conclusion), many serious injuries occur after falling from heights well below this rule of thumb. Indeed, there are some less obvious examples that are not especially high – like those on everyday heavy goods vehicles (unloading trailers, jumping down from a high cab) or working at ground level but close to a deep pit. There have also been some rather gruesome injuries after falling only a short distance but onto iron work protruding from reinforced concrete groundworks, or iron railings below. This is the sort of thing you might find in the Omen movies – yet another useful source of injury scenarios. Work at height is therefore not as well defined as you might think and, indeed, some of its features come into play very shortly after your feet leave the ground. In the old days people tried to define it in terms of a specific distance that you might fall – two metres or six feet was popular – but people began to recognise that it rather depended on what you were falling onto, or into. A more recent definition is therefore falling a distance likely to cause personal injury, assuming there are no safety measures in place, though ‘falling with style’ might be a definition that is more appealing. This then takes you into the woolly world of using a degree of judgement – oh yes, risk assessment again. Though for some freefall can be exhilarating, there has been an obvious recognition of the need to take specific precautions or suffer the consequences. Because the dangers are clear, work at height is quite tightly controlled in many countries. While general health and safety rules will also apply, construction, and in particular work at height, has received special attention. A model of this is C167 – the ILO’s (international Labour Organization’s) Safety & Health in Construction Convention 1988 (ref: ILO website). Article 18 specifically considers work at height but refers to national guidelines to clarify what that term might mean. It goes through a host of precautions that might be needed. Of course it is somewhat vague, because, well, it tries to appeal to different regions (for adoption) who will never agree on the detail. On a level below that, we have regional legislation. For example, in the EU there is council directive 92/57/EEC (as amended) which is concerned with temporary and mobile construction sites (ref http://eur-lex.europa.eu/en/index.htm). Annex IV is dedicated to specific health and safety requirements and Part B, section II, sub-sections four to six of that Annex deal with height issues – and yes, it really is that difficult to find. The EU supplemented this with very specific additional requirements on equipment for temporary work at heights – Council Directive 2001/45/EC. These European rules are then implemented at a national level – that is, placed in their local legal enforcement regime wrapper. This takes account of contextual differences and perhaps reflects the mature view that a one size technical solution does not fit all, even though the objective and basic principles are the same. Alternatively, it could just reflect the fact that many countries just do not get on and will never agree about anything other than the dream of a lavish personal expenses account. Someone has clearly been busy. Supporting these are numerous standards covering the technical design and use of (and sometimes training in) special access equipment e.g. Scaffolds and Mobile Towers (EN 12810, 128110, 1004), Suspended Access Equipment (EN 1808), Mobile Elevating Work Platforms (EN 280, ISO 16653 series), Safety Nets (EN 1263-1), Ladders (EN 131 series), Personal Fall Protection Systems (EN 363). Because work at height has been around for so long, the philosophers, or giants of thought among us, have got to work to give us a neat strategy to approach work at height problems, I think it probably boils down to ‘just don’t do it’. It’s taken them ages to come up with this, but I’m sure it was worth it – I won’t mention that it was rather obvious to the people who work at height but, as you know, academics like to put things in boxes. Risk assessment is an obvious first stage but in most cases a relatively trivial exercise. This is largely because the risks of work at height in most common scenarios are well known. The choices available to you for managing those risks are also mostly well known. Where people really need the help is in making the right choices of access equipment in a given situation. In the absence of specific legal direction, real companies have to weigh up the competing demands of time, cost, resources, space requirements (proximity of other buildings) against the benefits in terms of a marginal increase in safety. Individual home owners are even more aware of this – they don’t generally keep a handy mobile access tower, or MEWP, as a second vehicle in the garden. When it comes to building construction and maintenance, the building design and location will greatly influence the choices available to you for safe access. So, the input of building designers is especially relevant here. The UK even has a code of practise covering building design for this exact purpose (BS 8560) – to encourage designers (i.e. architects) to take work at height access requirements into account from the very beginning. There is a companion code (BS 8454) which covers training for work at height. In selecting the right approach to manage work at height risks, the following strategy is in common usage. A form of it is described in council directive 92/57/EEC, previously referenced and mirrored in many national implementations. Avoiding things is not generally considered a good trait – except avoiding death, prison or taxes. In truth, even in safety it is not always good to avoid things as it can engender a ‘can’t do’ attitude which becomes an excuse for not managing things that should be managed. Opportunities are then missed. Having said that, avoiding an unnecessarily risky activity should at least be considered even if you later decide it is not practical or possible. It is never a good idea to walk on a fragile roof without any precautions that you know very well is unlikely to support your weight. Avoidance here typically means instead being able to do all, or some of the job at ground level – such as pre-assembling some sections on the ground. For example, some light fittings can be lowered to the ground to change the bulbs; window cleaning can be done with water jets/extension hoses; hedge trimming/pruning can be done with extension poles – but, beware. You may now be in danger of things falling from height on top of you. 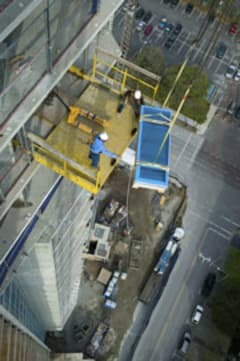 Where you can’t avoid work at height, prevent falls of people and materials. There are many different techniques for this, the commonly observed one being scaffolding, tied to the building itself. This solution creates a safe, but temporary work platform, the guardrails and closely laid boards doing a good job of stopping you falling, although it’s still possible to slip through if you try hard. Toe boards help prevent falls of materials. Guarding added to the edges of roofs is another example. Mobile versions of these include tower scaffolds, MEWPs and cradles – platforms which are suspended from the top of the building. It is universally recognised that ‘collective’ protection – that is a mechanism that protects everyone working at height – is preferable to personal protection, which only protects the person wearing it. Personal fall prevention includes things like work restraints – a combination of a harness and a fixed length lanyard which works like a fixed dog leash, typically about 1.5 metres long – but please do not try to use a dog leash. These simply do not allow you to approach too close to the edge, or other such hazard. They rely on anchor points or anchor lines on the building – don’t forget to clip the lanyard to one, otherwise it will not work. They restrict your reach, so may not work for some tasks. The next choice is minimising the distance or consequences of a fall. Again, collective measures are preferred over personal measures. Collective measures include air bags and nets – these are a popular way of minimising the consequences of a fall rather than, necessarily, the distance. Personal protective equipment in this category covers things like rope access – various forms, some may prevent falls and some minimise distance – and fall arrest systems. Fall arrest systems are different from fall restraints, as it is still possible for the worker to get into a position where they could fall. The advantage is greater freedom of movement, and indeed the worker may need to approach close to the edge. If the worker should fall, however, they have a shock absorbing section, or device, that arrests the descent in a controlled deceleration, rather than a sudden stop that could cause severe injury. These, like work restraints need to be anchored sensibly – above the worker rather than below. The length of the shock-absorbing lanyard/arresting device when fully deployed must be shorter than your fall – taking account of your height too. It is clear that you have to be quite a distance from the ground for fall arrest to work properly – typically around six metres – otherwise you will hit the ground before it deploys. Finally, if none of the above are workable, your choice comes down to equipment such as ladders, hop-ups (low platforms with folding legs), trestles and stilts. These don’t prevent falls nor do they minimise fall distance or consequences. Several words of warning – you often need to use a combination of methods and have an eye for the overall risk. Don’t end up reducing the specific risk of work at height but then increasing it in some other area through poor choices of control strategy. Erecting some forms of protection is not without risk either. Do not forget that managing the way you work needs to be factored into all of this. For example, the effects of wind are more pronounced at higher altitudes and when carrying large sheet materials, fixing a sheet roof in high winds might therefore not be a good idea. Simple housekeeping and waste management – rubbish chutes – on a scaffold platform help reduce the likelihood of trips and falling materials, as do covered walkways to protect people below. It goes without saying that workers should know what they are doing – training is vital – and equipment should be kept in good condition, so make sure it is regularly inspected. The UK Health and Safety Executive (HSE), no doubt making good use of tax-payers’ money and income from their Fees for Intervention (FFI) scheme have developed a handy access equipment selector tool, called WAIT (work at height access and information Toolkit – see http://www.hse.gov.uk/falls/wait/wait-tool.htm). It’s especially useful for jobs you might not tackle that often and want a bit of direction on your options. The tool takes account of a range of important factors – height where you are working, duration of work, how often the access equipment has to be moved, whether there is restricted access, type of work (heavy versus light) and whether the access equipment needs to be freestanding or not. So, for a relatively low risk task like indoor decorating, at a height of, say, up to 1.5 metres, short duration and you need to move around a bit, your choices would typically come down to a small range of options: a hop-up, step ladder, mobile scaffold or podium steps. If you’re a decorator you probably knew that already. The UK HSE has made strenuous efforts to remind people that ladders are not banned. Ladders can be absolutely the right choice where the work is short duration, light and access is limited. The organisation wants people to make sensible choices.